It was only last week when the younger generation of Bollywood paid a visit to Narendra Modi in New Delhi. In a bid to discuss how the entertainment industry can contribute to nation building, the likes of Ranveer Singh, Vicky Kaushal, Aushmann Khurrana, Alia Bhatt, Rohit Shetty, Rajkumar Rao, Ranbir Kapoor, Ekta Kapoor, Ashwiny Iyer Tiwari and Bhumi Pednekar came under the same roof with the BJP leader. 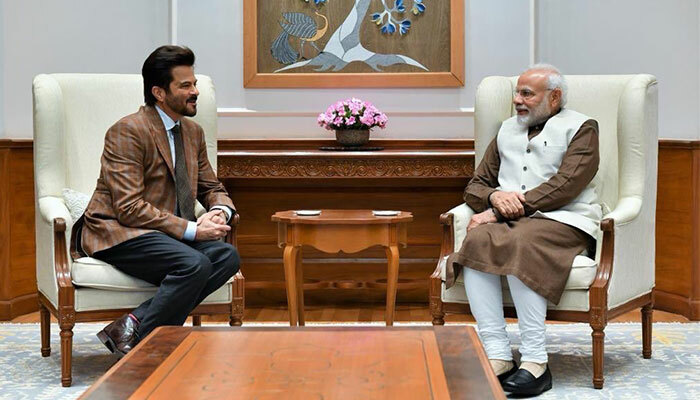 And now, it was the evergreen Anil Kapoor who went on to meet PM Modi on Wednesday. Taking to Twitter after his date with the PM, Anil Kapoor heaped praise on the man and was thankful for the opportunity. While his charm had definitely bowled the veteran actor, Twitter decided to showcase the moment in their own special way. And as you have already guessed, it was raining memes on the micro-blogging site. Modi : We will win 2019 elections !